I live in Boston. Or rather in Somerville - over the river, as we locals say, across the Charles from downtown. It's a short walk from my apartment to the halls of MIT and Harvard, a bike or subway ride to Tufts and Boston University, easy access to the constantly expanding hub of hospitals, research institutions, biotech giants and start-ups, next-generation technology companies. It's a smallish city, a homey one. It has only a fraction of the glamour and rush of London or New York. But it offers a never-ending supply of intellectual stimulation. In other words, the perfect home for a science reporter. I was first alerted to the bombs on Marathon Monday by a Facebook posting from a friend in Atlanta, a fellow science journalist. I felt my world drop out, the way it had so many years ago on September 11. And I spent much of the next hours locked onto the Boston Globe's website, following Twitter and Facebook and texts, unable to put my phone down for even a minute. My heart broke. I wanted to stretch it outward, further and further, wrapping those jagged edges around the city I've called home for more than 15 years. And then, just 24 hours later, I found myself getting ready to head to the airport and leave Boston to travel to Washington, DC for TedMed, a version of the famous TED conference on "ideas worth spreading," as the website says, this one with a focus on medicine. I had to turn my thoughts to innovations in healthcare and away from surgeries and shrapnel. I had to temporarily part from Boston and from the tear that ripped through my home. The cab easily navigated the few remnants of downtown traffic. My security line barely registered. But then I noticed the man next to me in the yellow runner's cap, wearing a thin jacket that read "Boston Marathon 2012" on the back. And once again, my chest constricted in sorrow. I wanted to say something. I couldn't say anything. The plane soared out of Boston and sailed along the east coast, over the site where the World Trade Center towers once stood, heading towards the Pentagon where yet another plane plummeted almost 12 years ago. It felt like yesterday. As we dipped and swayed through the night, descending into Reagan National Airport, the plane curled past the Washington Monument, a red-tipped lighthouse rising into the sky. The Capitol Building glowed white through my window. I felt the sentimental tug of connection, the love for country that wells up and connects us in moments like this. And then: medicine. Research. Healthcare. About 1800 attendees packed into a dark, burgundy-lined theater in the Kennedy Center for the Performing Arts. Towards the end of the opening session that first night, Rafael Yuste took the stage. Yuste, a professor at Columbia University and co-director of the Kavli Foundation's Institute for Neural Circuitry, is one of the instigators of the new moon walk, the most recent Human Genome Project. It's called the BRAIN Initiative, or Brain Research through Advancing Innovative Neurotechnologies, a multi-year project announced by President Obama on April 2. 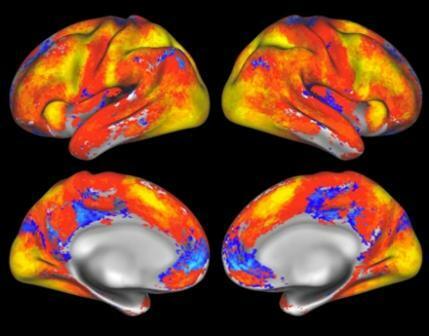 In 2014, $100 million will be devoted to the effort to map the neural circuitry of the brain. Yuste explained that we know shockingly little about the brain. For instance, we can only treat the symptoms of diseases including schizophrenia and epilepsy, because we don't understand the causes. The brain contains millions of interconnected neurons, yet we try to understand the brain's functions by prodding a handful of neurons at a time. "It's like sitting the living room and trying to watch a movie by looking at a single pixel," he said. The idea for for mapping the real-time activity of neurons in the brain was born in a conference in 2011 of fifty researchers, half of them neuroscientists, the rest physicists, geneticists, nanotechnologists. Critics said it would cost too much money; if the money arrived, there'd be too much data; if researchers could store and process all that data, they still wouldn't know what to do with it. George Church, one of the greats in genetics and synthetic biology, said those same criticisms arose with the founding of the Human Genome Project. President Obama eventually chose the goal of mapping the brain, this seemingly impossible quest, as this century's premier scientific challenge. Yuste described the project in a sweeping pronouncement: "I would argue that it's not only the right of scientists to imagine and to dream but our duty... Historically, every time society has advanced, at the root has been a scientist and an engineer dreaming." "Let's not settle for modest goals and incremental advancement. Science cannot afford to dream small dreams," he continued. He mentioned the quest to put a man on the moon, Queen Isabella sending three small ships out across the Atlantic. Grand journeys that revealed truths about the world, and about the universe. Since the attacks, I've found much beauty in the world. I weep with empathy when the sad, haggard faces of the surgeons appear on the news. They answer questions about the patients and insist that they'll continue to do the best they can. I feel a swell of pride when I read about the endless list of Bostonians offering a bed, a couch, a meal to those who were stranded or who were cut off from their hotel or their homes. The BRAIN project has inspired criticisms about how the research will be conducted and what the goals should be. But in Yuste's speech at TedMed, I found myself inspired by something grand, by a vision of humanity that takes chances, that bets on crazy goals and nearly insurmountable odds. That sees a challenge as just that: a challenge, one that can be met. Not an impossibility. Projects like these do more than help society achieve new heights. They inspire us to reach quite literally for the stars and to try to understand science and humanity's most unyielding questions. They inspire new generations of scientists. And for one night, when I needed it most, this project inspired me. Follow Scientific American on Twitter @SciAm and @SciamBlogs. Visit ScientificAmerican.com for the latest in science, health and technology news. © 2013 ScientificAmerican.com. All rights reserved.